Throughout the Metropolitan Riveters 11-1-0 start, there are many different storylines to be told and one of them is the story of third-year NWHLer Tatiana Rafter. It’s not just her production on the ice where she is one point away from last season’s total with four games remaining on the schedule, but it’s also what she has been able to accomplish off the ice as well as an ambassador for the third-year league. As one of the league’s most active personalities, Rafter has been able to inspire, reach and connect with a number of fans, while at the same time showing a steady progression in her game since entering the NWHL. Following her team’s home games she is often one of the last players out signing autographs or taking selfies with Riveters’ fans. The task of playing with Morse, or Lauren Wash, or Kelly Nash, or Lindsey Hylwa, or Madison Packer, or Harrison Browne on any given weekend seems to have allowed Rafter’s game to grow and evolve from her progression last season as she has been able to adapt to any situation the coaching staff has put her in. “Our team is great when we all play to our system so I just really try to stick to that as my framework and I think if I get outside of that, that’s where it might get complicated if I try to change it with these moving parts all the time. I just really try to reinforce the basics and communicate a lot during that Tuesday/Thursday ice-time and practices so that we’re on the same page,” the 25-year-old told The Hockey Writers. “I think that’s probably the biggest challenge, just being on the same page. But I’ve never had an issue going into a weekend, I always feel like I have a lot of trust in the people I’m playing with and everyone has really bought into what we are trying to do. 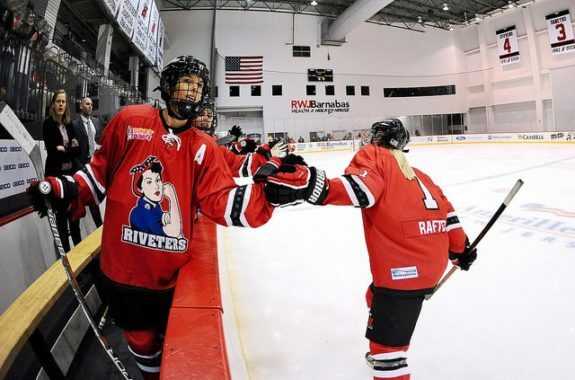 It makes it easy.” The Riveters have rolled their way to a lot of wins this season and often they look so in sync all over the ice like they have been playing and practicing together five times a week. But that’s not the case as we all know, as the majority of the NWHL’s players either work a full-time day job or are going to school for an undergrad program, or interning somewhere in hopes of it leading to a full-time job. Rafter, who is originally from Winnipeg has split living this season between New York City and New Jersey, where she now resides with a billet family. 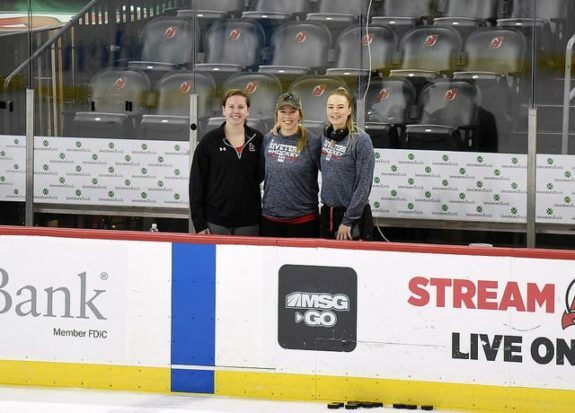 Rafter now has a podcast once a week (From The Rafter) and longtime readers of THW or followers of her might recall the entries she posted here during the end of the inaugural NWHL season. “My education is in psychology and maybe communications would have been a better fit,” she told us with a laugh. The sky is the limit for Tatiana Rafter and with her enthusiasm, she has the potential to do some even more really good things on and off the ice as this season winds down.